PTO Generators / Tractor Generators are the answer! A generator consists of an engine and alternator … by using the Power Take-off (PTO) on the tractor you can eliminate the need for an engine. PTO Generators / Tractor Generators are designed for mobile or standby electrical power and are ideal for any farmer as they are powered from the PTO of a tractor. These generators offer reliable, simple and practical source of power when a tractor is available. Using a PTO Generator eliminates the associated service costs to maintain an additional engine, along with the cost of the engine itself. 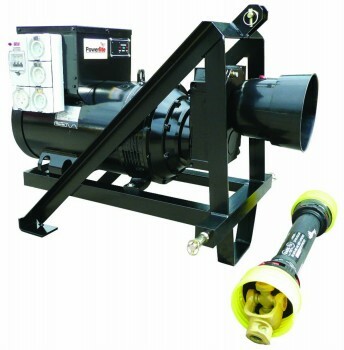 If the alternator is brushless it makes the PTO generator virtually maintenance free with a greater service life when compared to a standard diesel engine powered generator. It is a piece of equipment that can be basically forgotten till called upon, compare with a normal generator which needs to be started a least once a month to ensure it starts when power is required. Popular applications include dairy farming, poultry and piggeries where a consistent power source is critical to the operation of the business. 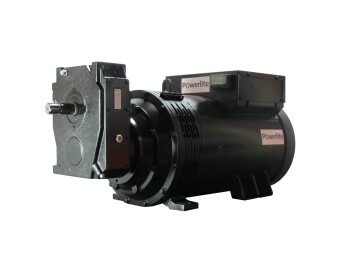 Powerlite PTO Generators are Australian designed and manufactured using industrial duty Italian made Mecc Alte brand alternators, one of the world’s largest and respected alternator manufacturers. Available with a range of outputs from 8 to 105kVA (20Kw/25hp – 160Kw/200hp PTO output). For example, 50Kva will require a PTO output of approximately 65kw/82hp. Standard features include 2 bearing 1500rpm brushless alternator fitted with a heavy duty speed increasing (1:3 ratio) gear box, Powerlite speed indication module, PTO drive shaft & safety coupling guard. Options include a locally manufactured heavy duty 3 point linkage frame with category 1 , 2 or 3 linkage pins (specify at time of ordering), one three phase and three single phase weatherproof socket outlets with circuit breaker protection. So if you have a tractor and you need a generator the best option is a PTO Generator / Tractor Generator, as you already have an engine on the tractor and just need to link it to an alternator to produce power.